Sun Xia decided to become a butcher in Shanghai after graduating from Hainan University in 2012. While most graduates prefer to work in an office environment, some have opted to work behind a butcher’s block. Wu Ni finds out what motivates them. Wielding a sharp knife, Sun Xia expertly carves a chunk of pork into several sections. Ribs, lean meat and streaky pork are smartly divided. She looks every bit like an old hand in the butcher’s trade except for her age – a far cry from what she was like a few months ago. Then, the 22-year-old university graduate from Hainan University could not even hold a knife steadily. Sun sells pork in Aohua Market in Tianshan Road, Changning district of Shanghai. While most meat stalls in the market reek of freshly slaughtered meat, Sun’s stall is brightly decorated with posters. The only female butcher in the market, she is always neatly dressed in her work clothes of yellow and green. "My mom still cannot accept my career choice to be a butcher," Sun says. "I guess her only concern is decency, after all, parents are afraid of losing face when talking about their children’s jobs. But I don’t care and I think the job is promising," Sun says. She is confident of a future with her employer, Farm Pork No 1, a pig raising and pork producing company based in Guangdong with about 500 stores in the province. The company launched 12 pork shops in Shanghai on Jan 25. Among the 108 employees at its Shanghai branch, half are university or college graduates. 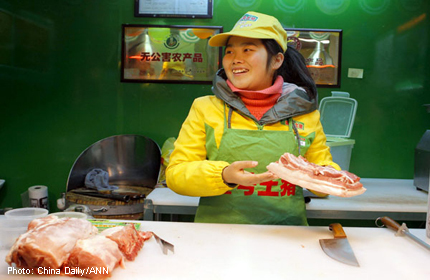 In China, it is almost unthinkable for a graduate to become a butcher. In 2003, Lu Buxuan, a graduate from Peking University, opted to sell pork for a living after he failed in various jobs. His case sparked a heated debate throughout the nation. But, according to Chen Sheng, founder of Farm Pork No 1, society is changing. "Most university graduates still refuse the work, but there are some who would like to try." There are about 600 university graduates in Chen’s company, almost a third of the employees. "We attract them based on our credentials as a modern enterprise. We are not traditional pig farms. "We emphasise high-end products, food safety and brand awareness. Our pork shops are no different from McDonald’s chain stores. "The perception of butchers is, they are rough and rude. But our employees are polite, skillful and we emphasise good customer service to meet the demands of China’s growing middle class," he says.